I was asked to bring dessert to a bridal shower the other day. 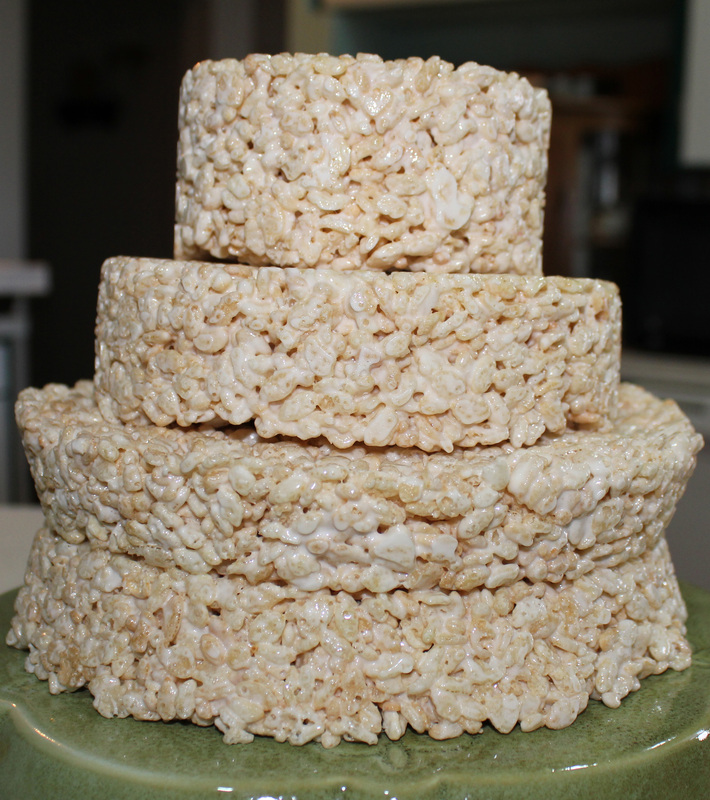 The bride-to-be mentioned one of her favorite things to eat was Rice Krispies Treats. 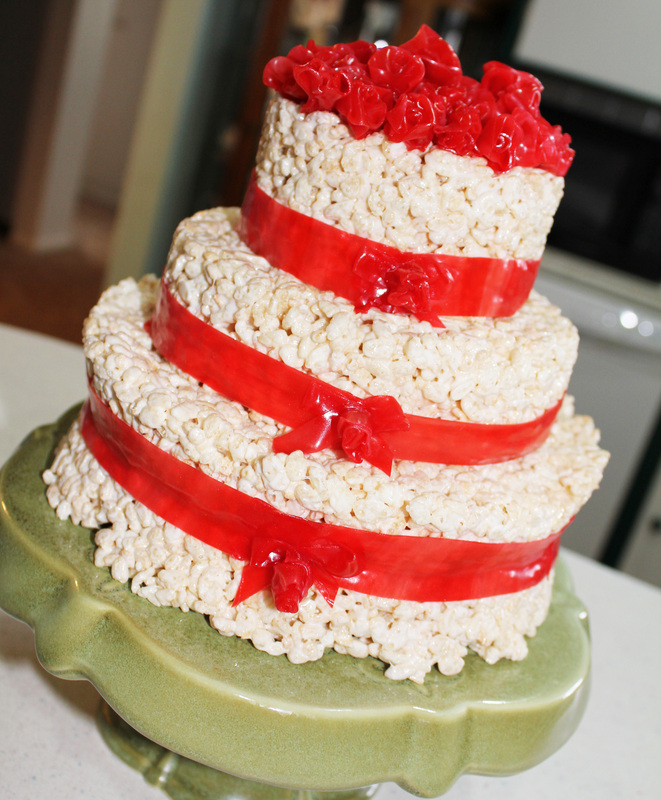 So I decided to make her a “wedding cake” out of Rice Krispies Treats with Fruit Roll-Ups for the trim. It was a lot of fun to make and not hard – it just took some time. 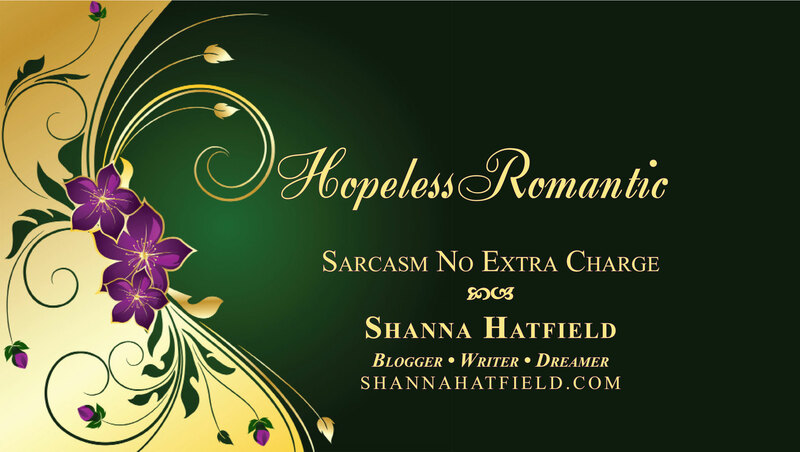 You want to give yourself about an hour and a half, start to finish, to do this project. 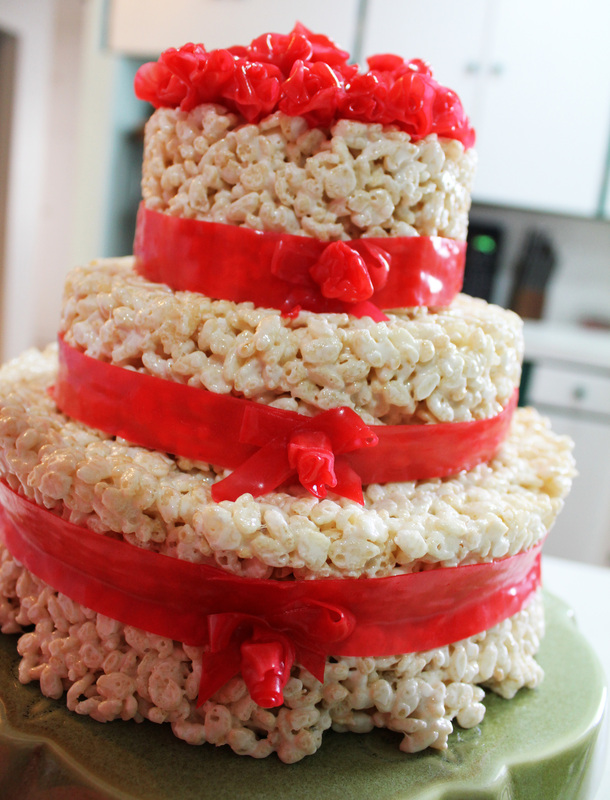 The cake was a big hit with both the bride and the guests – so that really made my day. Melt marshmallows and butter until smooth. Press into greased cake pans. Make your rosettes out of Fruit Roll-Ups. Cut a strip and start winding it around until it looks like a sweet little rose bud. You need to make approximately a gazillion of these (or three dozen). Make a bow by cutting a thin strip and looping it over one side then another to make a bow. Trim ends diagonally. You need three bows. Assemble your cake layers on a cake stand or serving platter. 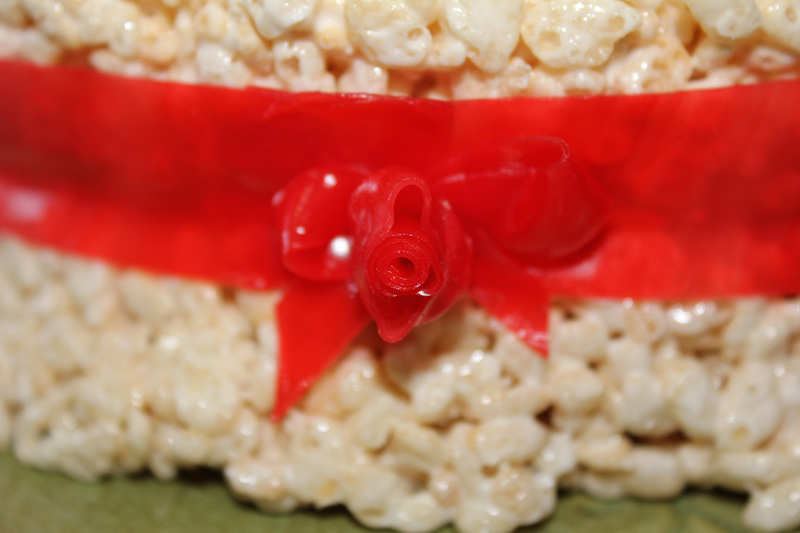 Wrap a “ribbon” around each layer and finish with a bow and rosette. Place roses all over the top. They will stick together and stay on if you make sure they don’t get too greasy from the cake. Give yourself a pat on the back and be prepared for the exclamations of surprise and joy over your creation! In a microwave-safe bowl heat butter and marshmallows on HIGH for about 3 minutes. I stirred after each minute. 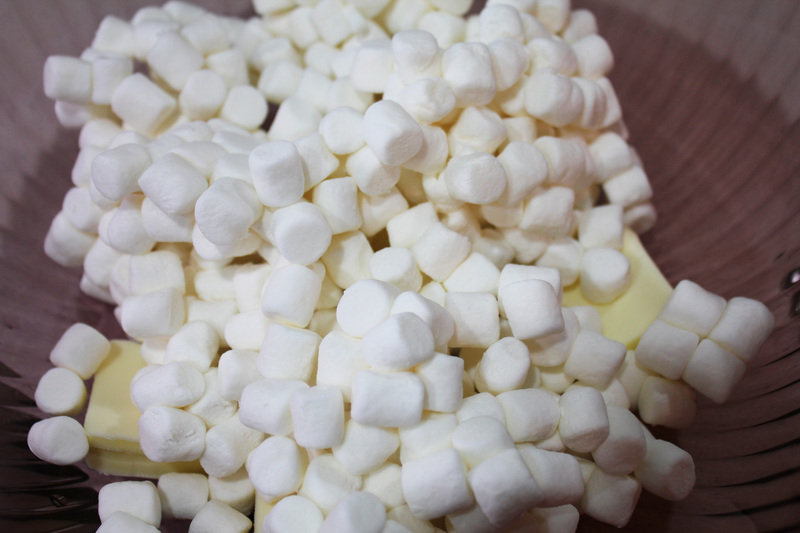 Stir until marshmallows are completely melted and smooth. 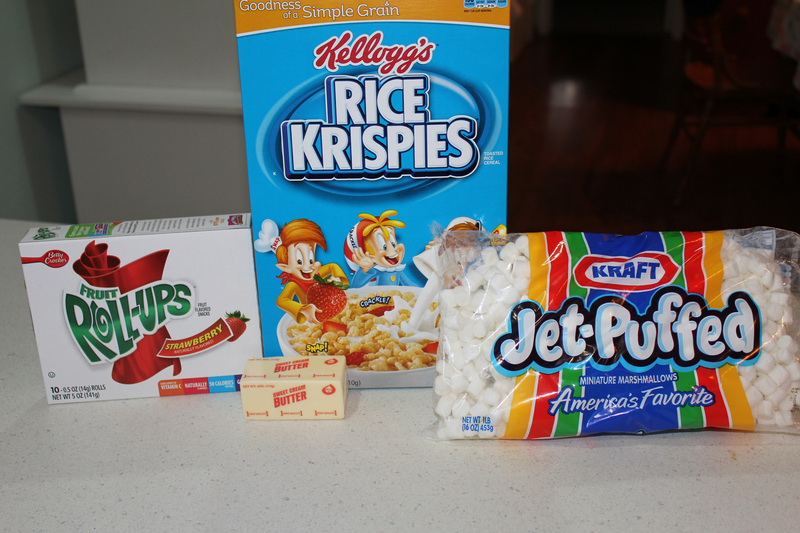 Pour in cereal and mix well. Grease cake pans. 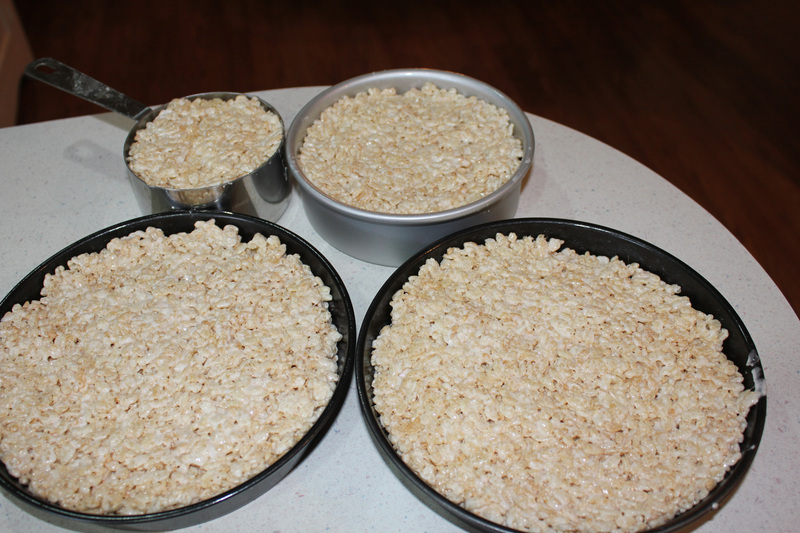 I used two 8-inch pans for the base, a 6-inch pan for the middle layer and a 4-inch pan for the top. 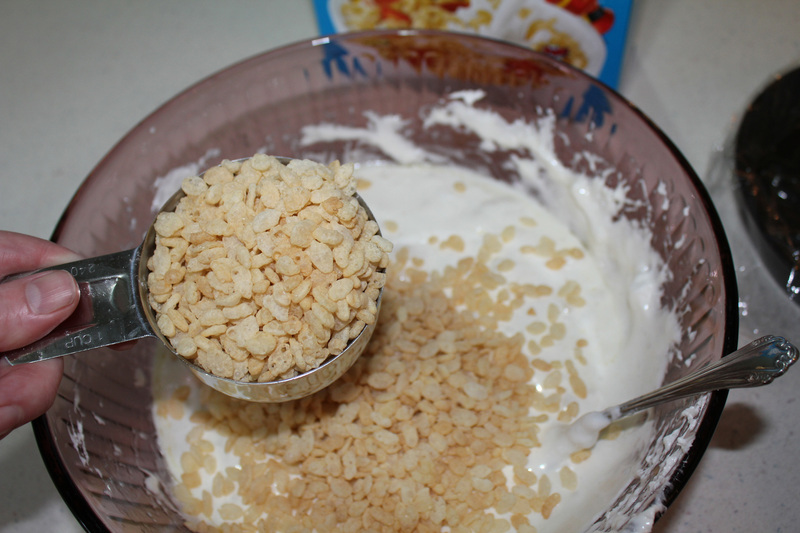 Spoon mixture into pans and press down. Set aside. Cut strips about 1/4 inch wide and about 4 inches long. 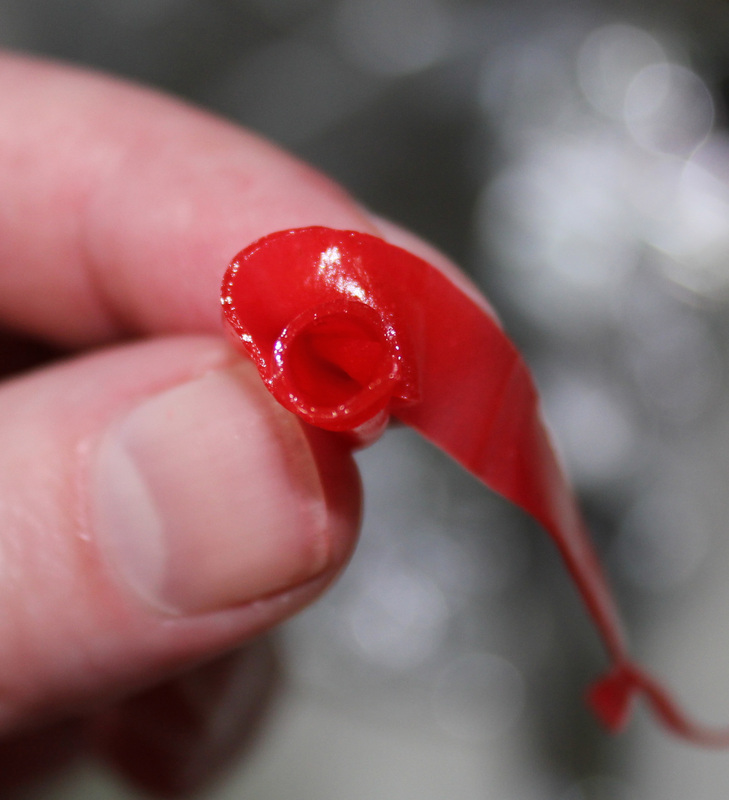 Starting from one end, roll a tight little center for your rosebud. Continue lapping the roll up around that center, pinching in one end with your fingers as you go. Don’t pull it tight as you roll it around, let it wave a bit to make it look like petals. You’ll need approximately half a million rosettes for the cake (not really, it just seems like it!). I think I made about three dozen of them. Set aside. Place your bottom layer of your “cake” on your serving dish upside down. Put the second half of the bottom layer directly on top and face right side up. Add the middle layer and the top. The treats are sticky enough, they will hold together without worrying about them wiggling around. On a cutting board cut into 1/2 strips for the ribbon around the cake. 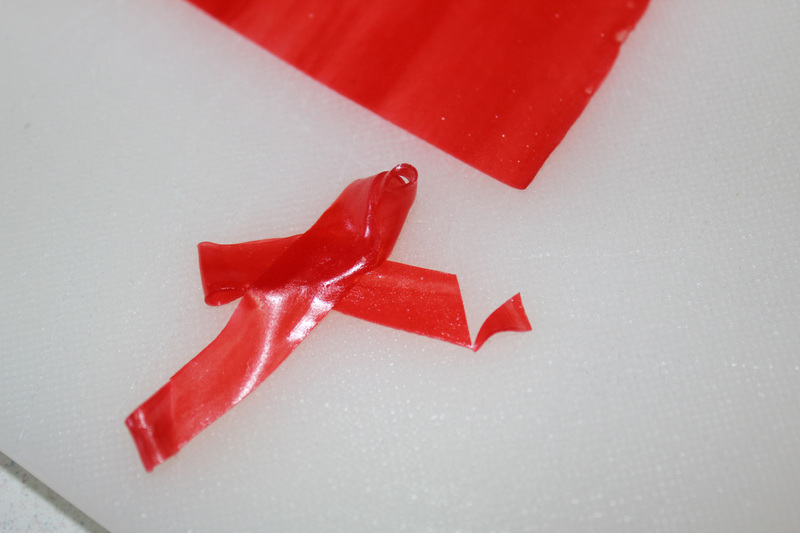 Because these are sticky, they are easy to layer the ends to make the ribbon as long as you need. I pieced them together as I placed around the cake. I used them to hide the layers. Cut 1/8 inch wide strips about 6 inches long for the bows. Just fold to make a lop on each side, trim the ends and press onto the ribbon on the cake. 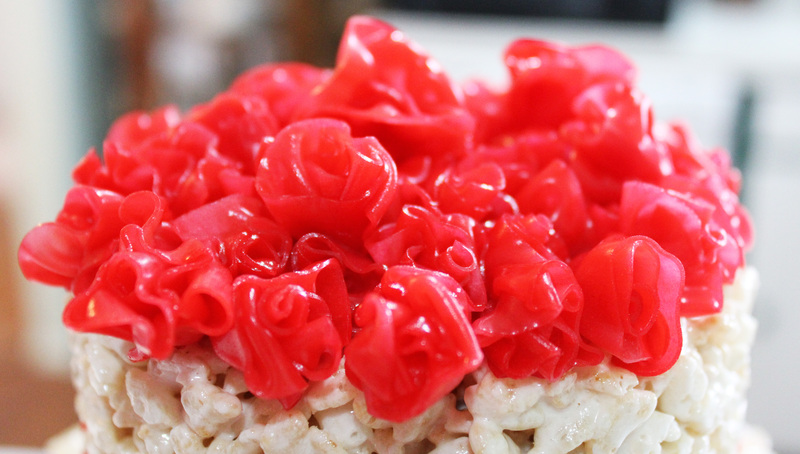 Add a rosette in the center. 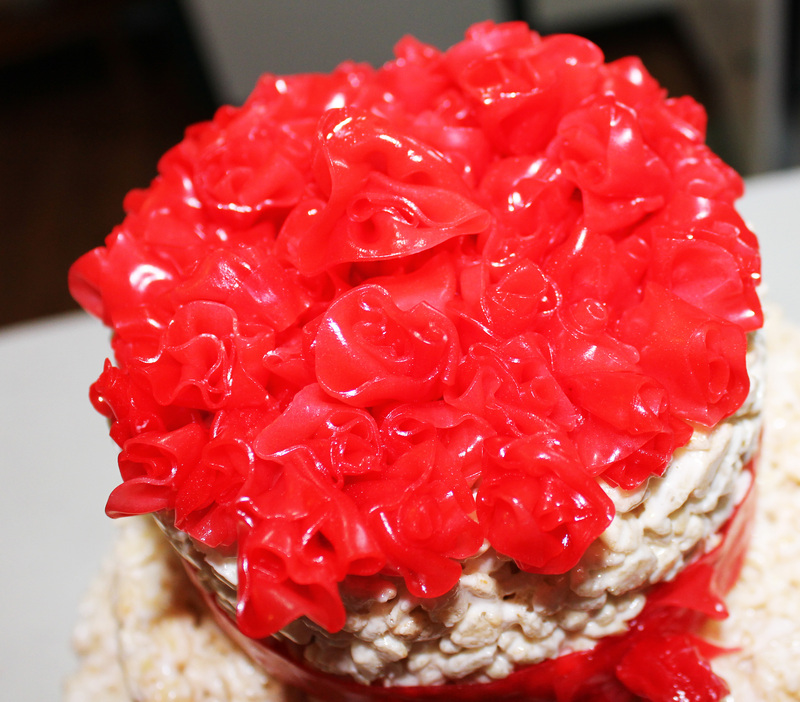 When you have the ribbons around the layers, gently press rosettes into the top of the cake. The stickiness of the whole thing holds it together really well. If you get grease on your fingers from the cake, make sure to wash your hands because the Fruit Roll-Ups do not stick to anything once they get greasy.